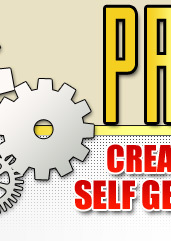 "Create Unlimited, Self Expiring, Self Generating Promotion Codes And Offer Special Deals Or Limited Time Promotions To Your Prospects, Customers, Or Business Partners"
No longer are promo codes limited to simple "coupon codes" that your customers & prospects use just to get a discount. Discover how to market with promo codes & increase sales...without giving a discount. We have been developing proprietary, web based software that will allow you to easily create unlimited promotion codes for placement on your marketing websites, landing pages, squeeze pages, and offline direct marketing pieces. "Coupon Codes"...for the most part are not effective when it comes to "marketing" your product or service. Because coupons and online coupon codes ONLY work AFTER a purchase decision has been made. Or, at best, they help entice your visitor to make a purchasing decision based on price. 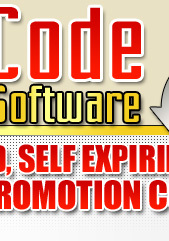 For example, we could offer a coupon code for this software. If we did, and you wanted the discount, you would have to already know about our service, know that you want it, and make a decision to buy based on the discounted price...for this marketing technique to work. Let's look at how a normal "coupon code" works. You can find them everywhere. We found that one in about 20 seconds after doing a Google search for coupon codes. Well, like we said above, this strategy only works when someone has already decided to buy. So...it's not really a "problem", let's just say that you are limited with what you can do with coupon codes. Promo Code Software is designed to get your visitors involved DURING the decision making process by guiding your visitors through an entire sales process. The Membership, in it's current form, will allow you to create and track unlimited, custom coupon forms that you can place on your website to offer your "visitors discounts/sales prices", redirect your visitor to a "secret" page by entering a special code on your site, or send them to a page (you designate) where they can print coupons so you can encourage customers/prospects to visit your physical location for redemption. Of course, the software will also drive prospects to your website for digital redemption as well and is fully compatible with all online payment processors. Our Promo Code Software has an easy administration panel that you will be able to log into and quickly create, manage, track all your coupon codes and forms. All code forms are automatically generated and can easily be pasted to your web document or web page. Create "one-time-use" or "permanent" online coupon codes and redemption forms. Self-expiring promo codes that expire by year, month, week, day, hour, and minute create a sense of urgency for your prospects to "buy now" or subscribe now. Ability to instantly generate a unique code for each website visitor, dynamically, while they are on your page (Great for "one-time-offers" especially if you don't own a OTO script). Since you can create codes that expire, you can create a OTO to enter a code that is only good as long as your visitor is on your page. Build an opt-in subscriber list by offering discounts to subscribers only. Our software has been developed to generate and automatically email coupon/promo codes when your visitors sign up to your email list. Create special offers for your customers, JV partners, and affiliates. Make various offers to different business associates or keep your offer the same for all. The choice is yours! Track how many times your code has been used...create multiple codes and track which ones were the most effective. Easy Admin Panel with secure login, manages all your promo codes and displays usage and effectiveness stats so you can track your campaigns to see what's working and what's not. If you want to create a promotion with the code "discount" or "7 Day Sale," you can create what is called a "special code," which is a user defined code or you can make it anything you want. Then you just tell the software where to take your visitor when they enter the correct code. In the form below. It will take you to the page we indicated it to take you to if you entered the correct code. Now, type in an incorrect code. You'll notice that the software will take you to an error page. This page can be anything you want. Send your visitors to a discount page, an affiliate promotion or even a download page...the software is flexible and YOU dictate where you want your visitors to end up. I'm a little bias but Promo Code Software is pretty cool. We didn't create a "random" code function for "lazy marketers" who are too lazy to define their own code. We created this feature because were aware that you may have many different lists or mediums on which you do your marketing. 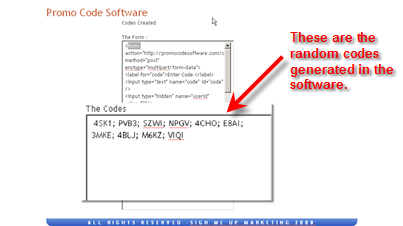 Perhaps you want to create multiple promo codes that ALL point to the same promotion. For example, you may have 3 email lists for different niches, a physical mailing list, and an Adwords Account. That gives you a total of 5 different areas that you may want to promote the same thing to. The software will generate 5 random codes. You can use a unique code for each list and track the effectiveness of your campaign by looking in your admin area of the software and looking to see how many coupons were used broken down by coupon code. 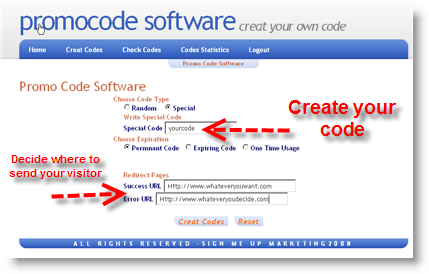 Each visitor on your site, landing page, thank you page...where ever you place the "show code" button...will receive their OWN unique code. Plus, if you don't want that promo code to be shared all over the internet you can set the promo code to expire if you want. Yep, that's right. If you want the code to only work once (to show a One-Time-Offer) you can do that. Or, you can set it to expire in 2 days, 5 hours, and 3 minutes from when your visitor created their code. The really cool thing about this is that it works for each visitor. In other words, visitor "A" may visit your page, click the button (to reveal a promo code) and the expiry starts for that particular code. Next, visitor "B" enters your site and they click the button as well. A new code is generated and will expire based on the time that visitor "B" clicked the button. Make sense? Click the "show code" button and enter the code in the form above for a demo. The code that is generated is set to expire in 1 minute after you generate the code. 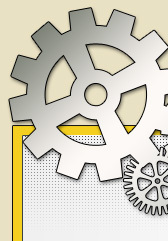 We're talking advanced marketing here...but our software makes it a snap to set up. Only your imagination can limit what you can do with Dynamic Promo Codes. You are active on this website. You're not just reading a sales page. You are actually checking out different promo codes to see where they go. Were getting you to interact with us in real time. 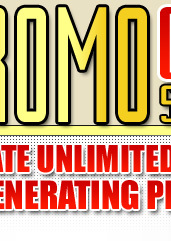 Now, imagine what you can do with Promo Codes to get YOUR visitors participating on your site. Getting your visitor to take action is the first step in any sales transaction. Through the use of Promo Codes as an interaction method between you and your website visitors you are getting them to participate and you are training your visitor to take action. No longer are promo codes limited to simple "coupon codes" that your customer uses to get a discount. You can use Promo Codes to guide your visitors through an entire sales process. Jason made a good choice asking me to be a pre-beta tester. As any software support staff who has had the bad luck to get stuck with me will tell you, me and software are quite often like oil and water. If there is a way to totally muck it up, I will find it. However, setting up a coupon code with Promocodes control panel was so easy, I kept wondering where the pitfalls were. It took me less time to create the code than it did to FTP it to my sales page. I kept thinking I must have missed something or made a hash of it somewhere. Then, I tested it and it worked flawlessly. So, I kicked it out into the harsh realities of the real world. I sent my list a Valentine's Day special (where they had to enter the word "valentine" in a small box at the bottom of the sales page). The next morning I could see the results in my PayPal notifications. It was that easy! Now, it's going into beta phase and I'm sure there will be little tweaks that make it even better, but it's working pretty slick already. This Is Your Lifetime (Charter Member) Invitation! Only 400 Limited Lifetime Members Will Be Accepted. After we reach our goal of 400 initial Charter Members this service will revert back to a monthly subscription based membership. Only 400 89 memberships left! This website automatically updates with each membership enrollment. Once we reach 400 members, this lifetime-no- monthly-fee offer will expire. The only way to access the software after we reach our goal will be to subscribe to our monthly membership plan. There is nothing to download. There are no SQL Databases that you need to set up on your own server or anything like that. Just sign up, login and begin creating promo codes within 5 minutes from now. Remember, You're about to receive Lifetime Access To Web Based Software With No Monthly Fees. Unannounced Price Increases During Charter Membership Phase. Please remember, "Limited Lifetime Memberships" are only being offered. We expect minor bugs to be reported...but we'll fix 'em as we see them happen. Therefore, lifetime memberships at one low price will only be available for a short time. However, Lifetime memberships will NOT be offered after we reach 400 Members. The only way to access the software will be to purchase a monthly membership. This is an online service and monthly membership fees will be applied if you purchase in the future. P.S. As a Lifetime Member, you will enjoy LIFETIME access with full upgrades and enhancements as they are developed. You will NEVER be charged a monthly fee even when we roll into membership mode. We're doing this to gather "usability" feedback to implement additional features for when we release this software as a monthly subscription. We'll be making enhancements to this service until we get this to work the way our users actually want it to work. As a Member, we value your feedback and we want to reward you for helping us make this software one that marketers WILL use on a daily basis. P.S.S. For the price of an average marketing report (which sits unused on your hard drive) you can have access to a powerful marketing tool that will super charge your marketing efforts both online and off. Track your offline marketing campaigns through your control panel, to know which ads are working and which are duds. Remember, we are developing this software around our Members and will continue to enhance its features based on user feedback. Become a member today. You won't regret it. Hurry! We only have 89 Lifetime Memberships left. After that, this offer goes away and you will have to subscribe as a regular monthly paying member if you want to access the software and all the enhancements we'll be making. (c) 2007 Promocodesoftware.com - All Rights Reserved.